This is the advance reading copy of Skinwalkers. 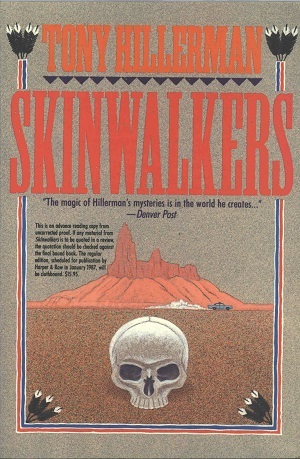 The seventh book in Tony Hillerman's Navajo Mystery Series. This cover is special because it is the first cover created by artist Peter Thorpe. His use of Navajo traditional figures and plot elements was very successful and he illustrated more than 40 Tony Hillerman novel covers. Format: Paperback, 23.3 x 15.5 cm. Binding: Full-colored pasteboard covers with the author, title, publisher's name, and publisher's logo are printed vertically on the spine.